However the aftermarket Roadster wire wheels will work but you must let me know you are going to use them so that I can turn down the center hub on the rotors to fit the center of the wheel. This will require a $40.00 extra charge. You use your stock spindle and suspension. Remove everything except for the spindle and the rest is provided. 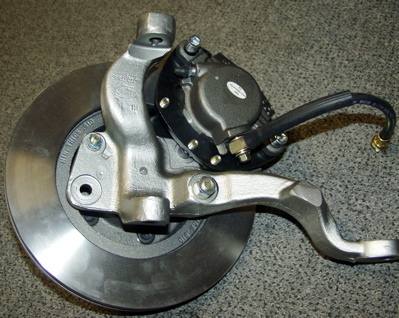 With this conversion you do not have to disturb any of your suspension nor steering. You cannot however use your stock 14" wheels. There are numerous 14" wheels that will work. 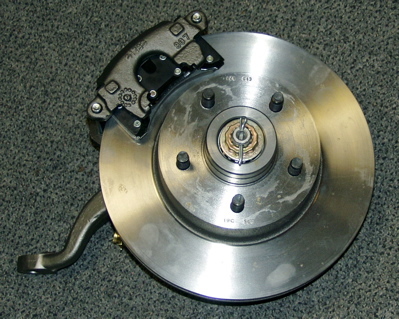 You will have to look at the offset to determine if they will interfere with the caliper. However some that will fit are late 70's 14" such as torino and ranchero. The rotor is an 11" rotor so that it will provide plenty of braking power for these heavy cars. This is what the assembled unit looks like from the backside. Once again the only thing you do not get is the spindle. Above is a picture of what you all get. You will notice on the bottom there is also an adjustable proportioning valve which you need (an extra $40.00) when you have disc in front and drum in the rear. 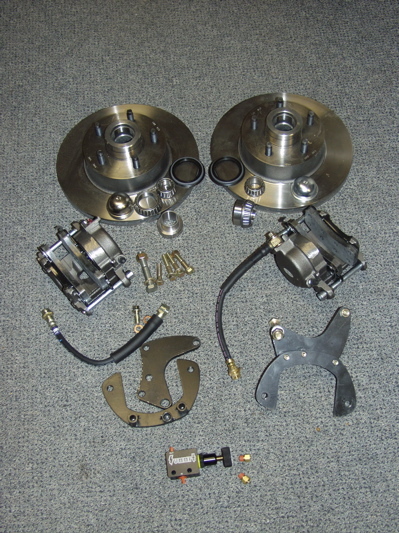 Price for this conversion kit is $595.00 plus shipping and handling. I do not sell the parts seperately as I want to know that you have everything you need to do a proper installation and not have to hunt around to try and find this or that. I have also assembled this completely on the pictured spindle so I know how it goes together so if you have a problem I can talk from experience when answering your questions.